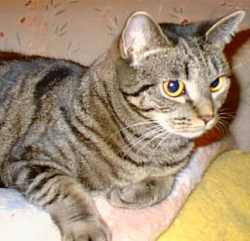 Tabitha and her 5 kittens were found in 1996 living in a woodpile. The kind lady who discovered and fed them was eventually able to capture them and bring them to Kitty Angels. Tabitha's tail had been broken off and the bone was sticking out, but with surgery her tail was mended, and it healed nicely. 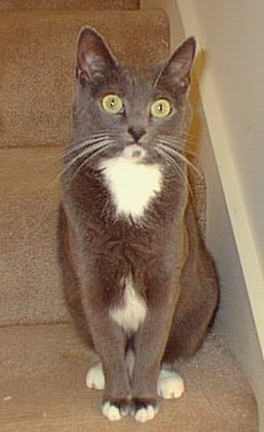 In August 1996 she went home with Patt and John, becoming their 6th Kitty Angel. Oh, and that kind lady, Marie, ended up adopting 2 of Tabitha's kittens - Misty and Splash. 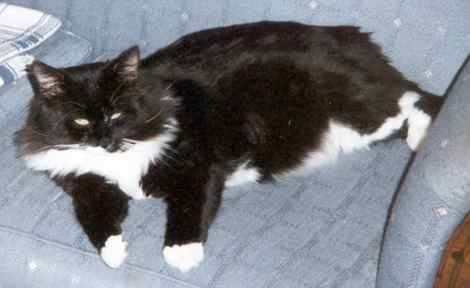 BJ was a 3-1/2 year old, scruffy-looking cat when he was adopted by Bob and Paulette. 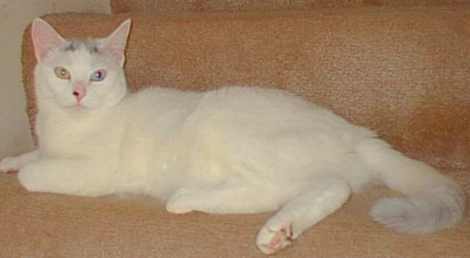 They write, "He is the most loyal and loveable cat we could have ever hoped for. He never leaves our side and we just absolutely love him. Looks can be deceiving."